PHOTO PROVIDED R.S. 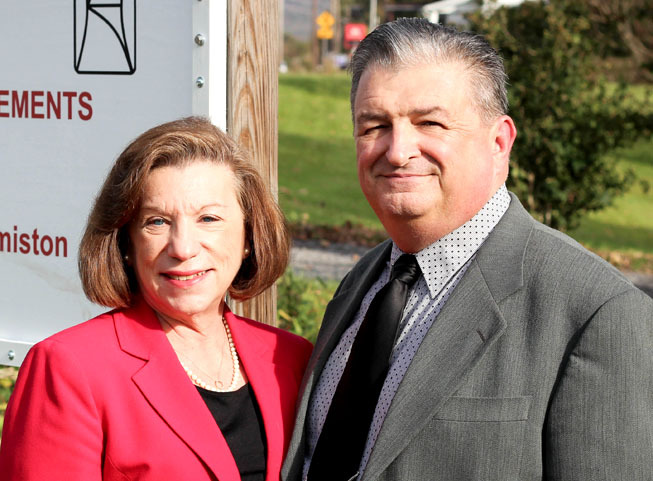 Associates Partners Kathy Spotts Humiston and Kevin Humiston recently placed a sign along Route 150 in Beech Creek on the property of Cathy Redmond of CJ Tuxedo Rentals. BEECH CREEK — R. S. Associates Insurance Agency in Beech Creek has provided guidance and counseling to clients throughout Pennsylvania for over 35 years. The agency specializes in consulting in retirement and estate planning, annuities, life insurance, Medicare supplements, ancillary insurance and health insurance, both group and individual. Since the passing of original partner, Ron Spotts, in October of 2015, his partner and wife, Kathy (Spotts) Humiston has managed the business and has continued to counsel and service clients’ needs in the greater Central Pennsylvania area. Originally from Clearfield, Mr. Humiston attended Penn State University, majoring in Psychology and Business Administration. He has years of management experience during the 20 years he lived in the Los Angeles, California region and both insurance and real estate experience since relocating to Pittsburgh, Pennsylvania in 2009. Mr. Humiston holds both PA State Insurance licenses and a PA State Real Estate license. His area of expertise rests primarily in health and supplemental insurance and is also knowledgeable in life insurance and annuity products. R.S. Associates is gearing up for the Open Enrollment Period from Nov. 1 to Dec. 15 when individuals can enroll and re-enroll in individual health insurance offered through the Federally Funded Marketplace as well as individual health insurance offered outside of the Marketplace. Partners Kathy Humiston and Kevin Humiston are also working with senior clients during the current Annual Enrollment Period for Medicare Advantage and Part D Prescription coverage. Seniors can enroll in or change plans during this Annual Enrollment Period. R.S. Associates Insurance Agency is in Beech Creek. Both partners Kathy and Kevin Humiston are eager to meet with anyone who needs help with health insurance for individuals and groups and/or retirement and insurance planning. They can be reached by calling their office at 570-962-2418 or sending an email to kevinhumiston.rsa@gmail.com.